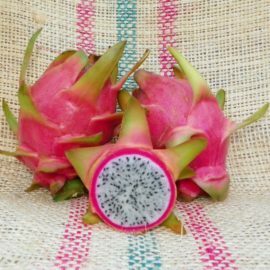 Hylocereus peruvianus Dragon Fruit variety comes from the genus Hylocereus and the species perivianus. It is a terrestrial plant of the open woodlands in the northern coastal area of Sechura to the Rio Saa valley, Peru. 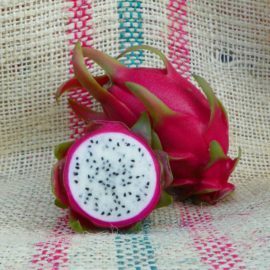 The fruit has a bright pink exterior with green fins that typically weigh 1 to 1.25 pounds. The flesh has a nice white pulp and very juicy. 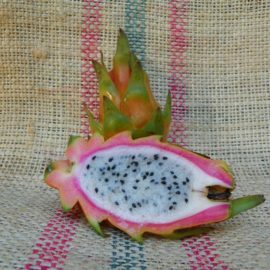 The flavor of the fruit is semi-sweet with lots of small crunchy seeds. This variety is very easy to set fruit due to it being self-pollinating. Both stems and flowers are like typical Hylocereus. However, stems grew and matured much slower compared to Hylocereus undatus. This variety was collected from a grower in California.